A Fallen Friend...so sad... Yesterday I was at a friend of mine's house, we were walking down to the garden for a chat when we heard quite a commotion. The noise was coming from the trees...two robins going crazy...alerting us to something... But what??? My friend noticed her cats congregating under the Walnut Tree.. Then we saw it.. a baby bird had fallen out of it's nest, due in part I'm sure to the storm we had earlier that day. Later we'd noticed a second baby bird out of the nest who'd perished most likely immediately from the fall. Or so it appeared. 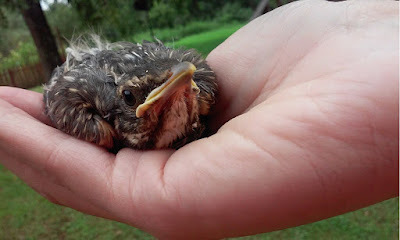 The other baby robin, was alive and well. The bird seemed almost fully grown, absent the ability to fly...and real bummer for this baby bird. The cats surrounded it...I of course used my mad voice...and they soon ran away. I held the baby bird in my hand...very cool experience. He was so afraid, I tried to calm him. I pet his little head and told him it all be ok... He kept opening his mouth at me like he was trying to squawk and send me away. The mama and papa birds continued to squawk and dive at where their fallen child had landed. We ended up putting the baby up on something high, and walked away. Our hope was that the parents would come down and get the young bird and fly him back to the nest...That was my hope.. they hadn't done that as of last night...I'm not sure about today.. If they don't get to him soon I'm afraid he won't make it!! !